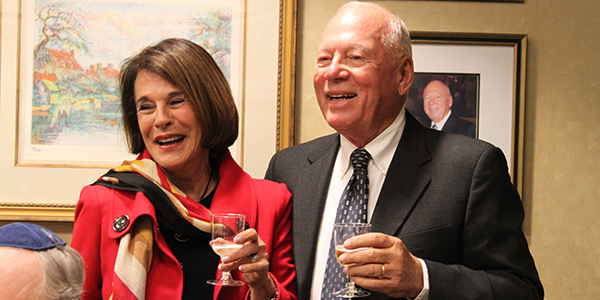 For the past 25 years, Louise and Alan Dabrow have fostered a legacy of commitment to JNF through philanthropy and support. Years ago, they were in Be'er Sheva when it was literally a city dump and Abraham's Well was just a gas station. Reflecting on how far the project has come, Alan said, "I have seen the beginning of the vision, and seeing what it has become is amazing. With a strong Israel, the Jewish people will survive. That has been our mantra." When the couple, who live in Haverford, PA, married in 1988, they each brought to the marriage an affinity towards Israel. Louise had fallen in love with the people and land of Israel on an eight-week trip with the Jewish Agency when she was 19 years old, during which she met David Ben Gurion. After being invited to a JNF board meeting by Alan's cousin, Alan Robbins, then-president of the JNF Philadelphia board, the couple was impressed by JNF's vision. In the early 90s they were part of a five-person delegation to Israel led by Zevi Kahanov, z"l. It was a trip that would ignite their strong commitment to JNF and all it does for Israel. "We both decided to get involved with a charity because we felt blessed and wanted to give back to the community in some way," said Louise. In addition to supporting the Be'er Sheva River Park, they have made contributions to JNF's Housing Development Fund, Timna Park and American Independence Park. At Ammunition Hill the couple dedicated a plaque in memory of Louise's brother, Jerome Shestack, in honor of his service as a 1st Lieutenant in the Navy during WWII and their granddaughter, Talia, has a plaque on the B'nai Mitzvah Wall. Their legacy of philanthropy proudly extends to the next generation: Alan's son Steve and daughter-in-law Lori made a large donation to the Be'er Sheva River Park in honor of Alan's birthday and has also contributed to the new JNF Housing Development Fund. The Dabrows are members of JNF's Century Council and Negev Society. They both hold national executive positions, with Alan as National First Vice President and Louise a Vice President of JNF's Board of Directors. Louise has also been president of JNF's Women for Israel campaign for over two years, during which they have created a women's executive board, raised $12 million in the past year alone, and boast membership of over 450 Sapphire Society members and over 100 Chai Society members. The couple chose to establish charitable gift annuities through JNF because for them, for JNF, and for Israel, it's a "win-win" situation. "When one buys an annuity you gain many tax advantages," said Louise. "Anytime we can have money invested to help ourselves and Israel, it is a no-brainer. As an individual you can make a small impact, but as a collective through JNF you change the face of Israel. We are putting all our efforts into insuring that Israel stays strong through JNF." As a result of their committed involvement, they have developed many lasting and meaningful friendships, including Be'er Sheva Mayor Ruvik Danilovich, City Manager Avishag Avtuvi, River Park Project Director Itai Freeman, KKL-JNF World Chairman Efi Stenzler, and KKL Director of Major Gifts Talia Tzour. Both Louise and Alan have participated in numerous JNF missions, as participants and as mission chairs. For the past decade, Alan has travelled to Israel with CEO Russell F. Robinson on the President's Society Mission. Louise first led JNF's Queen of Sheba Women's Mission to Israel in 2007 and has gone on the trip each year since. "You get a better view of what is really going on by visiting Israel and all of JNF's projects," she said. "It helps cement our relationship to JNF and to Israel when we see what is being accomplished."